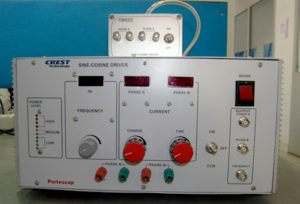 Coil Undulation Test System – Crest Test Systems Pvt. Ltd. 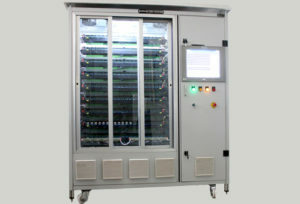 The Coil Undulation Test System is used for assessing the faults or imperfections in wound stator coils of PMDC motors. The system measures various parameters such as undulation (in %), peak generated voltage, phase angle, etc. Additional parameters can be measured as per the customer’s requirement. The Coil Undulation Test System makes use of a magnetized rotator rotating at a fixed RPM within the stator coils and measures the generated voltage signals from the coil terminals by using a high precision probing mechanism. 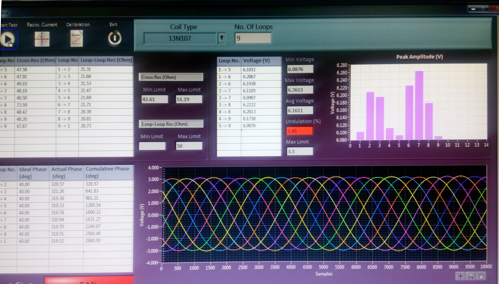 The undulation and various other parameters are measured by performing relative comparison or analysis of the signals received from each coil terminal. The system also detects basic faults like the terminals getting shorted or open circuit. By measuring the coil undulation we can understand that the setting of the coil winding machine is adequate or not. Whether the motor in which the coil is installed will perform adequately in terms of noise and vibration. Whether it will deliver uniform torque across a single rotation. Coil undulation measurements help in confirming that the configuration of the coil winding machine has been done correctly. Incorrectly wound coils cause noise and vibrations in the motor in which they are installed. The torque delivery across a single rotation is also non-uniform, thus affecting the performance adversely. AC Synchronous Motor Test System consists of a proprietary test software. All measurements are made by the system according to the parameters selected by the user in the software and the test results are displayed in the software for evaluation. The system shows the measured sinusoidal phase-shifted signals of various terminals graphically. The undulation can actually be seen by observing the variation in the voltage peaks across different phases.